Our Hygienists offer more than just scale and polish. They can treat all forms of gum disease and offer help with preventative treatment, tooth-brushing techniques and dietary advice. We can offer hygienist appointments even if you are not registered with a dentist at Southernhay Dental Practice – this is called Direct Access. Valerie qualified at Cardiff University Hospital in 1976 and re-joined the Practice in 2007. Karen gained a Diploma in Dental Hygiene at RAF Institute of Dental Health and Training in 1995 and joined the Practice in 2002. Hayli qualified from Cardiff University School of Dentistry. Previous to this she worked as a fully qualified dental nurse. After four years of doing so she decided to further her career in dentistry and joined us in 2010. Joanna qualified in the Royal Navy and has been a Hygienist for far too many years to mention! 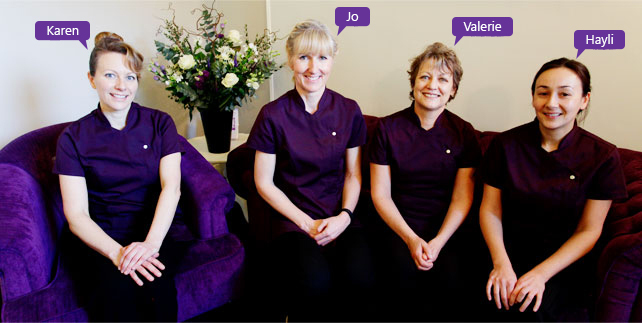 * Each Hygienist is supported by a dedicated Dental Nurse.